Uncommon Knowledge was set up by the prestigious Hoover Institution at Stanford University. This series of interviews, hosted by Hoover fellow Peter Robinson, brings together different contributions from scholars, leaders, practitioners and commentators on various topics relating to political science. 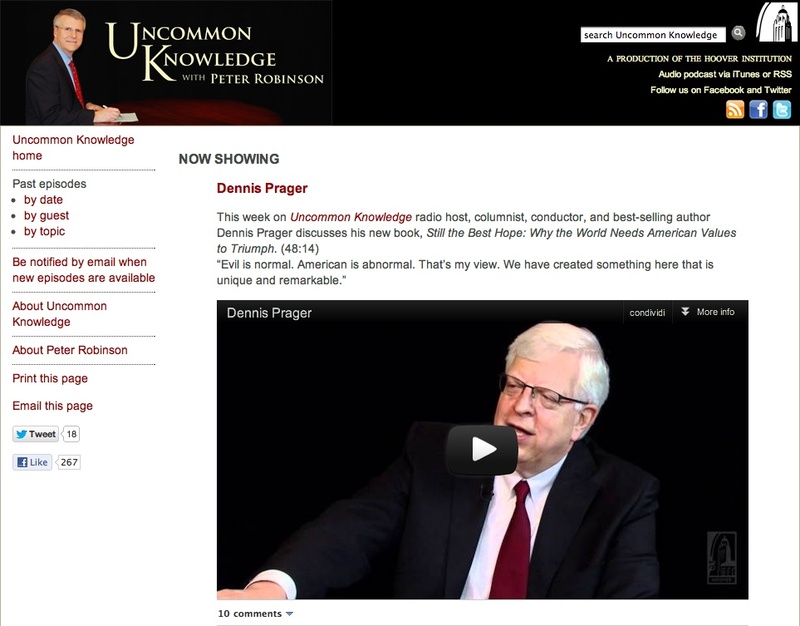 Uncommon Knowledge was launched as a TV show in 1997 but is now distributed exclusively on the web by a growing number of political websites and channels. The videos are divided into ten thematic categories ranging from U.S. politics to global cooperation and relations which are freely viewable – though not downloadable – on the website, as well as on the Hoover Institution Youtube channel. Each interview is introduced by a brief explanatory text and is available as a unique video or as a set of thematic segments. Full video transcripts are also available, as well as a space for comments. Users can follow the series on the site and on iTunes as video and audio podcasts or RSS feeds. The site is practical and easy to navigate thanks to simple search tools and browsing by date, topic and guest.